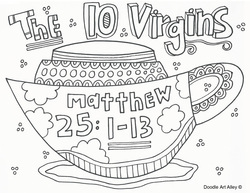 The Parable of the Ten virgins is a well know parable of Jesus. It is found in Matthew 25:1-13 of the New Testament. There are 5 virgins who are prepared for the bridegroom's arrival and 5 who are not. The parable teaches us that we need to be prepared for the Day Christ's Return.